Microsoft has released a patch for Windows 7 which brings along a new dialog box reminding of the most unfortunate news. Well, unfortunate if you don't want to change your operating system. See Windows 7 is about to go obsolete, in terms of software updates at least. The 2009 launched operating system will not receive support after January 14, 2020. The market share of Windows 7 was still over 35 percent in late 2018, and in fact it was just December last year that Windows 10 managed to overcome the market share of Windows 7. There's fortunately still plenty of time, 299 days to be exact. 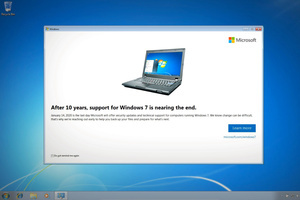 Unfortunately the free updates from Windows 7 to Windows 10 are far gone. Enterprise customers can buy an extended security update package that will provide support until 2023. If you happen to be in a fairly unpopular limbo of Windows 8, you will continue to receive updates until January 10, 2023.